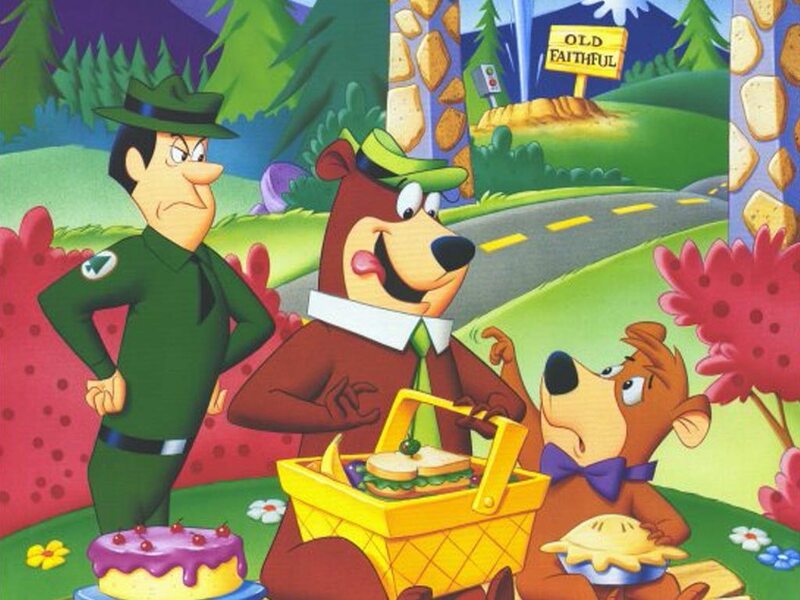 Yogi Bear was created by William Hanna and Joseph Barbera. Now what does this have to do with Yellowstone? Well, Jellystone was based on Yellowstone, and Yogi Bear’s antics of trying to get human food was based on grizzly bear behaviors of eating human food. “Yellowstone grizzly bears” by Florian Schultz. 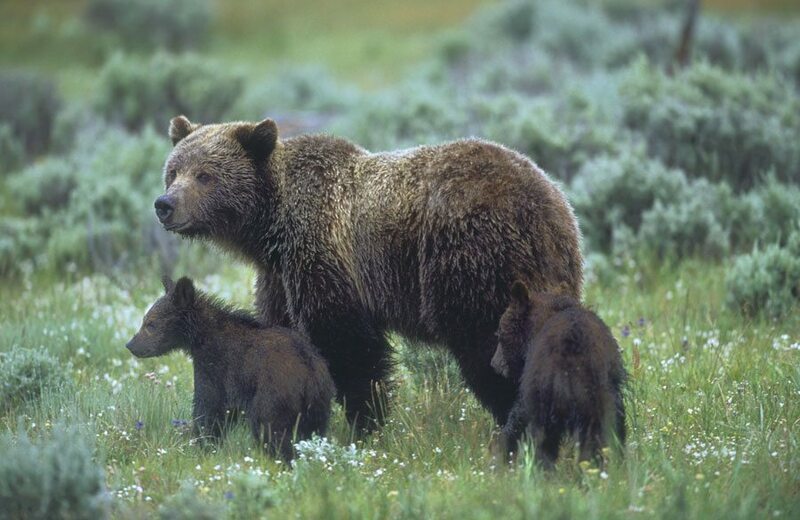 The grizzly bear is one of the most sought-after animals in Yellowstone National Park by tourists. Visitors on many of my tours through the Draper Natural History Museum talk about how they hope to see a bear before they leave, specifically a grizzly. And I’m in the same boat. I am from California, an area once famed for their grizzly bears, but that now has barely any. So, I too hope to see one before my time is up. Yellowstone grizzly bear, May 2013. Photo by C.R. Preston. Size: Grizzly bears are larger than black bears, with females weighing from 200 – 400 pounds, and males from 200 – 700 pounds. Hump: Grizzly bears have a large hump on their back that black bears do not have. Claw Size: Grizzly bears have larger and longer claws than black bears. Grizzly bears eat a lot and will eat almost anything. They are omnivores, eating trout, elk, honey, nuts, whitebark pine, and berries. However, what they eat the most are moths. Grizzly bears eat up to 40,000 moths a day , in the fall when they prepare to hibernate. The grizzly bear’s constant foraging began to cause problems in the park and the Greater Yellowstone area. They started eating human food that was either handed to them or stolen by them. As they began scrounging through garbage cans, Yellowstone Park put out a set of bleachers near a dumpsite so people could photograph and watch the animals forage . From 1931 – 1969, there were 48 human injuries per year . By the 1970s, park rangers realized that they needed new bear management programs. This started the campaign, “a fed bear is a dead bear.” They began extensive education for visitors, to increase awareness of the consequences of giving “Yogi” a snack. 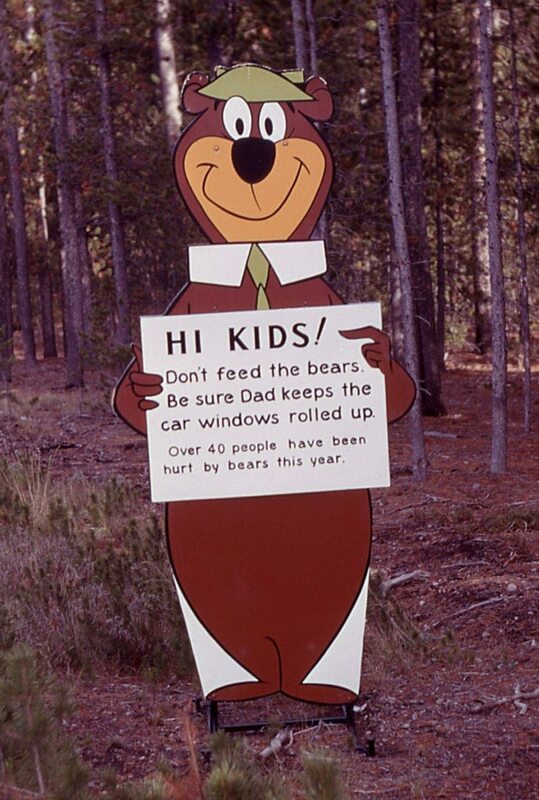 Yogi Bear “Don’t feed the bears” sign at the west entrance to Yellowstone; William S. Keller; 1961. Courtesy of the Yellowstone National Park Service. Grizzly bears are very smart animals, and if they discover an area that produces an abundance of easily-attainable food, then they will continue to haunt that area. So, the first thing that rangers sought to do was to eliminate what was attracting bears. They removed the bleachers and replaced all trash cans with ones that were hard for animals to open. The rangers say that most bear and human conflicts could easily be solved if people would remove what attracts bears. Bears have an extremely keen sense of smell, and are able to trace a scent from more than 15 miles away . The most important thing to do is to make sure that you do not leave out any food and throw your garbage away in the bear-proof trash cans . You want to make sure that a bear is unable to find it and give it a taste. The female mother bear and her cub in our exhibit in the Draper Natural History Museum have to do with this very subject. Our female, Bear 104, was hit by a car and killed, leaving her one-year-old cub, G86, alone. He began getting into conflicts with humans over food. Because he become used to people, they knew that if he kept following that behavior, he would eventually hurt someone. The only option left was to put him down, reuniting him with his mother. For more information on grizzly bear safety in the park, check out our videos. For more on grizzly bears, go to Yellowstone Grizzly Bear and Winter-killed Wildlife, Grizzly Bears and Whitebark Pine in Yellowstone, Greater Yellowstone Grizzly Bear and Army Cutworm Moths, Yellowstone Grizzly Bear and Yellowstone Cutthroat Trout, and Grizzly Bear Facts: Yellowstone Grizzly Bears Winter Hibernation Habitat; by Charles Preston, our senior curator of the Draper Natural History Museum. 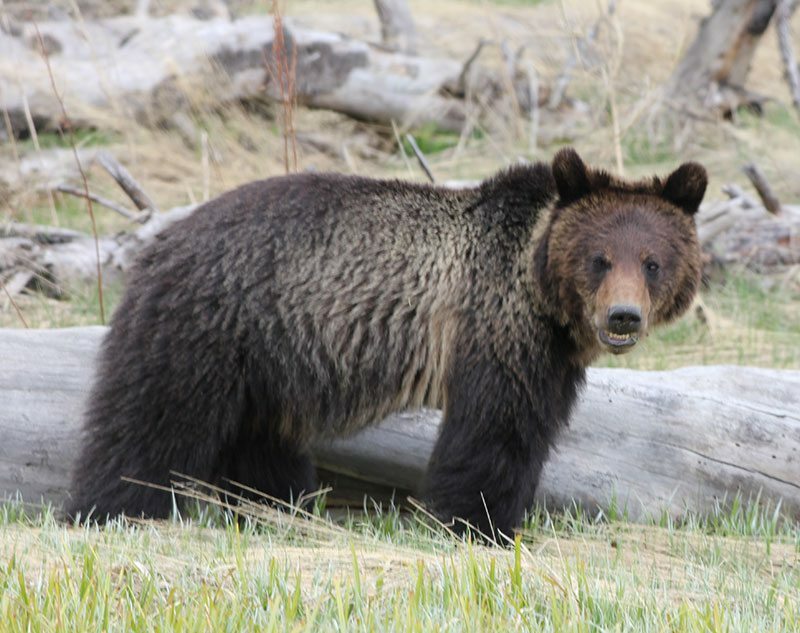 For more information on G86, go to Treasures from Our West: Grizzly bear 104′s cub, by Nancy McClure, our electronic communications manager and assistant editor of Points West . 1. National Park Service, “Bear Aware” (lecture, Draper Museum of Natural History, Buffalo Bill Center of the West, Cody, WY, July 3, 2014). 2. Emily Buckles, “Wildlife in the West” (tour, Buffalo Bill Center of the West, Buffalo Bill Center of the West, Cody, WY, June 2, 2014). 3. Michael Leach, “Grizzlies on My Mind” (lecture, COE Auditorium, Buffalo Bill Museum, Buffalo Bill Center of the West, Cody, WY, July 31, 2014). 4. National Park Service, “Bear Aware”. 5. Buffalo Bill Center of the West, “Fed Bear is a Dead Bear,” December 11, 2011, accessed July 23, 2014, https://www.youtube.com/watch?v=fr8rfpCbshk. Buffalo Bill Center of the West. “Fed Bear is a Dead Bear.” December 11, 2011. Accessed July 23, 2014. https://www.youtube.com/watch?v=fr8rfpCbshk. Leach, Michael. “Grizzlies on My Mind.” Lecture, COE Auditorium, Buffalo Bill Museum, Buffalo Bill Center of the West, Cody, WY, July 31, 2014. McClure, Nancy. “Treasures From Our West: Grizzly Bear 104’s Last Offspring.” Treasures from our West (blog). Entry posted March 13, 2014. Accessed July 25, 2014. https://centerofthewest.org/2014/03/13/treasures-west-grizzly-bear-104s-cub/. Miller, George. “Views of Yellowstone.” Tour, Buffalo Bill Center of the West, Buffalo Bill Center of the West, Cody, WY, June 2, 2014. National Park Service. “Bear Aware.” Lecture, Draper Natural History Museum, Buffalo Bill Center of the West, Cody, WY, July 3, 2014. Ulrich, Tom J. “Grizzly Bear.” In Mammals of the Northern Rockies, 88 – 95. 1986. Reprint, Missoula, MT: Mountain Press Publishing, 1994. The Yogi Bear Show. Cartoon Network. Broadcast 1961 – 1988. Directed by William Hanna and Joseph Barbera. Written by Warren Foster and Michael Maltese. Performed by Daws Butler and Don Messick.